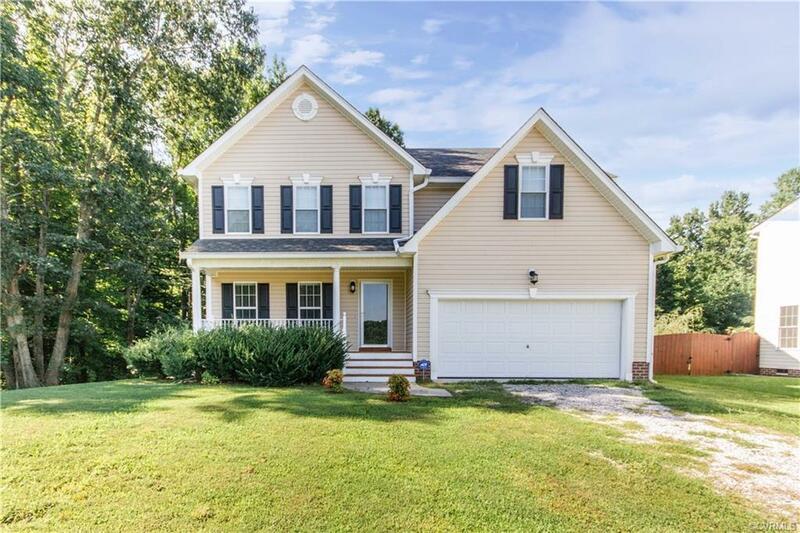 Prince George HOME- Move-In READY - 4 bedrooms, 2 1/2 Bathrooms 1st Floor: Flex Room = Formal Dining, Office, ETC., 1/2 Bathroom, Kitchen with Great Pantry, SS Appliances, Island with Storage. Open to Large Dining AREA which is OPEN to Living Room with Ceiling Fan, Great windows. 2nd Floor: Utility Room, Master Bedroom includes TWO walk in Closets, Attached full bathroom with double vanity, Separate Shower/Garden Tub, Tray ceiling, ceiling fan AND EXTRA 10' x 6' flex area (sitting, office etc). 3 additional bedrooms with ceiling fans and great closets, Hall Bathroom. Additional features include: .83 acres, 2 car attached garage with direct access, Nice 17x12 back deck, Cul-de-Sac, Move-In Ready. Conveniently located in minutes to Fort Lee, Rt 295, Rt 460, and Rt 95. Please SEE PICTURES! A Must See!! !